If asked to name reasons someone might smuggle birds into the country, chances are you wouldn’t think first of finch singing contests. For the Guyanese population in New York, N.Y., however, these contests are a cultural tradition, and many competitors believe the best feathered singing virtuosos must be brought in from Guyana. Finch contests are similar to horse races. As a bird out-competes its opponents, it becomes more valuable. Its owner plays for bragging rights and money, and the stakes can become high. Finches that have proven their worth in competition can fetch in excess of $5,000. Lesser seed finch. Photo from Creative Commons, Flickr, from Alastair Rae. A New York City man was sentenced recently in federal court for smuggling finches into the United States. 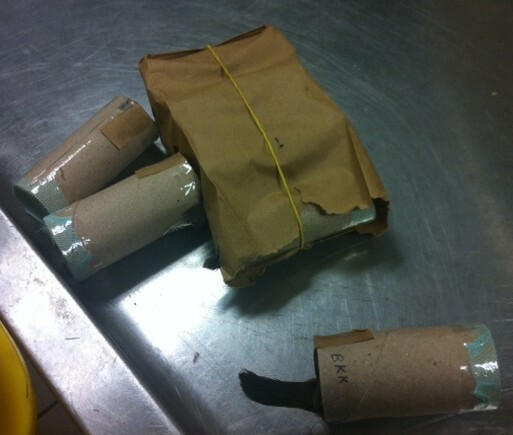 A year ago, Marlon Errol Hariram was caught when he arrived on a flight from Guyana at John F. Kennedy International Airport with nine finches hidden in toilet paper tubes stuffed into the sleeves of his shirt. A repeat offender, Hariram has been caught three times in the U.S. and once in Guyana with hidden finches. Under the federal Lacey Act, it is unlawful for any person to import into the U.S. any wildlife taken, possessed, transported, or sold in violation of any law or regulation of any foreign government. The Lacey Act is the oldest wildlife protection statute in the country and is used as a tool to combat the illegal trafficking of live wild animals and wildlife products. How does a singing competition work? Two finches are placed in adjacent cages. Male birds in close proximity will naturally start to compete for territory by singing. The contest is not based on the melody of a finch’s song, but instead the speed at which it sings. Bets are placed and the contest begins. The first bird to reach 50 notes wins. On April 16, 2013, Hariram was sentenced in federal court in the Eastern District of New York to six months in prison followed by two years of supervised release, as well as a $2,000 fine. Hariram pled guilty in October 2012 to three felony charges stemming from his May 2012 finch smuggling attempt. Charges included violation of the Lacey Act, smuggling and making a material false statement. Read a recent New York Daily News story about his case. This entry was posted in Blog entries, Law enforcement, Migratory birds and tagged american idol, finch, guyana, lacey act, Law enforcement, New York, singing contests, smuggling, the voice on May 6, 2013 by usfwsnortheastblog.